Apnea Academy West Europe organizes a course instructor in Castilian apnea every 2 years. The next course is scheduled on October 1, 2017 at the headquarters of the Academy in Tenerife – Canary Islands. The course duration is 7 days. There will be a minimum of 20 students. Dates will be from 1 to 7 October 2017 between the first or third week. The course will be topics of relaxation, breathing, physiology, respiratory, nutrition, communication techniques, teaching methods, psychology. Classes will be taught by specialists in each field. In addition to the teachings of Apnea Academy, its rules and sequence of exercises will be discussed. the theory of static apnea, dynamic, constant weight, variable weight is treated. Practical exercises include breathing and relaxation techniques at various levels, constant and variable weight and control group in the pool and the sea. All students will be filmed to analyze their technique. The course emphasizes training instructor as well as the development of technique and interpretation. Apart from the famous Umberto Pelizzari, the staff will consist of the most experienced teachers in the various disciplines of free diving and a selection of the most expert Apnea Academy instructors. – Static Apnea 4:30 minutes. – Dynamic Apnea 80 m.
– Apnea constant weight (with bi-fins) 35 m.
Aspiring instructors who are successful in the evaluation at the end of the course will become members of Apnea Academy and will offer courses in apnea 1st, 2nd and 3rd level, Apnea Discovery and Stage Apnea Indoor Freediver and Outdoor Freediver and assistant instructor within the structure of teaching apnea Academy, school for instruction and research and apnea free lung. We will provide all the extra course information and special accommodations for students to contact. The closing of entries is 10 September 2017. The squares will be stored in strict order of booking. Swim with perfection crawl (freestyle) and breaststroke. Underwater swim breaststroke with good technique. Perform static apnea 4 ’30’ ‘minutes. 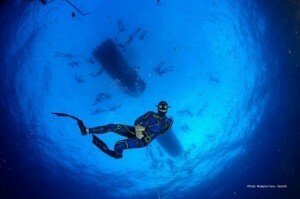 Perform a dynamic apnea with BIALET 80 meters. Staff team composed apnea suit, mask, snorkel and BIALET (leads may be provided by the organization). Manual “apnea course” editorial Paidotribo (those interested in having it can contact apnea Academy in West Europe mails or telephone listed above). First aid certificate valid the day of the course, and no older than three years. The organization will provide students apnea official uniforms Academy, at the end of the course. the BIALET are required to take the course.